Posted on Thu, Mar 15, 2012 : 4:49 p.m. The University of Michigan Board of Regents agreed unanimously Thursday to change the name of Crisler Arena to Crisler Center. The Athletic Department began phasing in the change on its website and news releases at the start of the basketball season, but the regents' decision makes the switch official. U-M Chief Financial Officer Timothy Slottow told the regents Thursday that because of a $52 million renovation and expansion currently under way at Crisler, the "arena" name is no longer fitting for the venue. "Crisler Arena has basically expanded and converted to many, many things beyond just a basketball arena," Slottow told the regents Friday. "For functional reasons, for appropriateness, we would like your approval to rename." 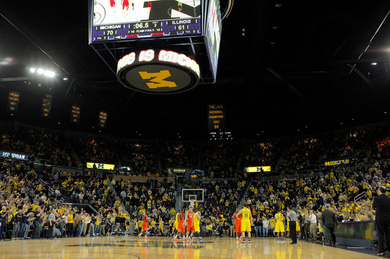 Crisler was built in 1967 and has been called Crisler Arena since 1970. The regents also approved a $2 million budget increase to the Yost Ice Arena renovation, which will begin in the coming months and finish before the 2012-2013 hockey season commences. The cost of steel, bleachers and detailed historic windows rendered the $16 million renovation more expensive than originally anticipated, Slottow said. Slottow noted that U-M already has received a $400,000 donation toward the cost of the historic windows. "The bad news is we're asking for an increase in $2 million in the budget," Slottow told the regents. "The good news is we've already received a donation to offset that." Fri, Mar 16, 2012 : 9:40 a.m.
No one voted against it? Get used to the new name. Fri, Mar 16, 2012 : 9:38 a.m.
Get used to it, maybe we can refer to it as CC for short. I would have hoped there would have been one vote against it. Fri, Mar 16, 2012 : 9:35 a.m.
Talk about group mentality; not one Regent opposed this proposal. So be it. It is now the law of the land. We can now refer to it as CC for short. Fri, Mar 16, 2012 : 1:11 a.m.
what happened to painting the ceiling white above the basketball court. Thu, Mar 15, 2012 : 10:44 p.m. This is plain silly. A university, of all places, should know better. This is branding gone wild. Who cares about the change of one word? It makes not difference whatsoever, but it will cost money, I wonder if anyone has tabulated what this will cost. There is definitely something very wrong with this university administration and this small but telling piece of nonsense is symptomatic. Fri, Mar 16, 2012 : 12:17 a.m.
What's the big deal? You make it sound like they're spending millions. It's only a name change. Good grief. Thu, Mar 15, 2012 : 11:17 p.m.
Thu, Mar 15, 2012 : 11:16 p.m.
Thu, Mar 15, 2012 : 10:13 p.m.
Great. Could have gone with Crisler Complex, but no... So now we UM has a Crisler Center and a Chrysler Center. Genius. Thu, Mar 15, 2012 : 10:03 p.m.
Crisler Center? Never heard of it.